ISSUE: Failure to deliver on free promotional item. Corrective action also failed. In late January 2008, I started making calls because it was well past the promised due date to receive the drives. I encountered my first issue when the phone number on the rebate form was for a 3rd party call center which wasn’t even handling this promotion! 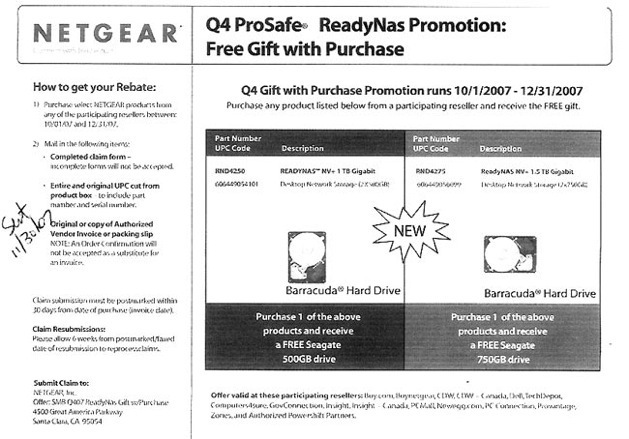 After speaking with a manager at that call center, she told me that Netgear had made a mistake when producing the promotional form. After some more prying, she were kind enough to give me a direct contact name and phone number for the person at Netgear who was responsible for the promotion. 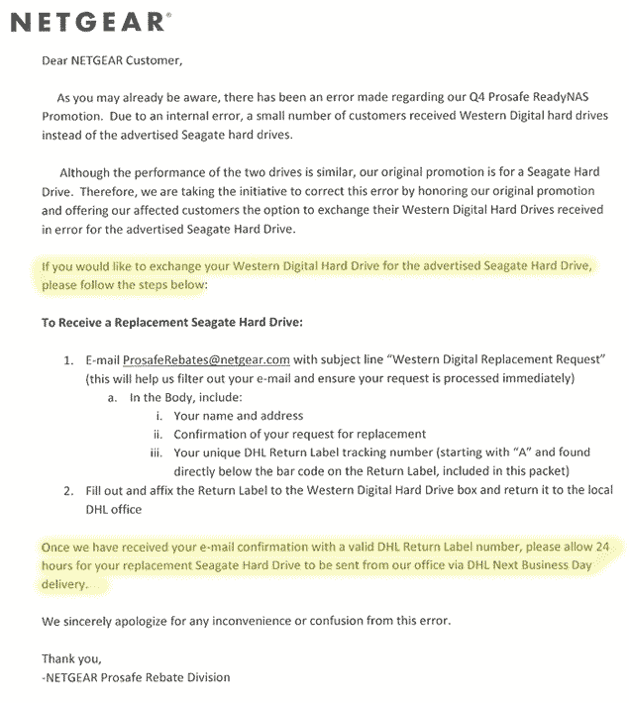 On January 28, 2008 I made first contact with Netgear and was told the drives were late to arrive at their offices, but they’d be going out early next week and since I had called, they’d send mine in the first batch as an overnight shipment. Three weeks later, after many unreturned emails and phone calls in the interim, I pushed enough to get another contact name of a Netgear manager in Los Angeles. As I had grown to expect, he never returned my emails or voice mails either. 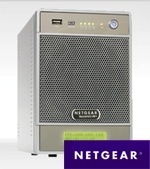 I spent the next two weeks making calls and sending emails to the whole group at Netgear with no replies from anyone. Finally, with the arrival of two DHL packages at my door in early March, I thought the issue would come to a close. Excited and hoping to put this consumer experience behind me, I opened each box only to discover they had SENT THE WRONG (AND INFERIOR) DRIVES! Finally, I thought, Netgear had seen the error of their ways and this would soon be over. In the letter, it clearly showed that they had made a mistake and they were going to correct it as quickly as possible. Wrong again. Despite me following the letter to a "T", Netgear failed on every point. They didn’t use DHL Next Day, didn’t reply to my email (ever) and only sent one drive! This is how to irreparably lose customers, piss people off and thus get top billing in my hall of shame. JEERS Netgear. No matter what you do at this point, you’ve already lost this customer. The Los Angeles-based manager finally called me and apologized. He said several people were no longer with the company based on the failures of this promotion. Here is his final letter to me. Again my apologies for the lack of customer service. Attached is your tracking # 263718xxxxx. I’ve requested Sat delivery but it is 50/50 %. You can track tomorrow. I took the liberty of sending you 2x750gb drives instead as you will probably need the space. Please let me know if you need additional support. I received the drives on Saturday, and, despite the months of bad customer support and contact, consider this issue to be resolved.